- Als „Wissensintensiver Produktionsstandort“ nimmt sich die Region mit ihren Zentren Graz, aber auch Maribor bereits heute wahr, was aber ist zu tun, um sich in der steifen Brise des Triumphs der globalen Märkte zu behaupten und damit die Zukunft zu gewinnen? - Auch für eine zukünftige „High End Destination for Services“ gibt es mit einem ausgezeichneten Dienstleistungsangebot im Gesundheits-, Kultur- und Tourismusbereich Ansatzpunkte in der Gegenwart, wird eine überalternde Gesellschaft im Kulturerbe Europa aber innovativ genug für diesen hohen Anspruch sein? - Wer sich als Zentrum bei der Entwicklung erneuerbarer Energien und Antriebstechnologien als „Région Créateur d’Alternatives“ am Nachhaltigkeitsstandort Europa positionieren kann, hat schon gewonnen. Aber wird das Genie und der Esprit der Region reichen, um von dauerhaft hohen Spritpreisen zu profitieren? Manche Antworten, aber hoffentlich viele richtige Fragen werden die Leserinnen und Leser, die sich auf dieses Buch und das Nachdenken über die Zukunft der nächsten 20 Jahre einlassen, belohnen. 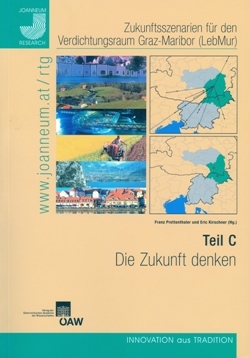 The current book is the third part of a work in three volumes dealing with possible future scenarios for the conurbation covering the area from Graz to Marburg based on a detailed study of three Styrian and three Slovenian NUTS level 3 districts. Following on from the detailed analysis of the region’s status quo in Part A, and the setting out of the general conditions and methods to be used in Part B – which also introduced in particular scenarios for the European framework: “the Triumph of the Global Markets”, “European Cultural Heritage” and “Europe as a Centre for Sustainability” – the present volume presents the results of the research. Part C, “Thinking the future” sets out the three main scenarios for this cross-border area taking into account important parameters in the fields of man, the environment and the economy. The titles of these three scenarios are essentially programmes for how the area can embrace the demands of developing within its international and European context and turn them to its own advantage. - With its centres in Graz and Marburg the area already sees itself as a “Knowledge-Intensive Production Centre”, but what more must be done in order to maintain its position against the strong prevailing winds of the triumphing global markets and so assure the future? - With its excellent facilities in the fields of health, culture and tourism the area also has a starting point for development into a “High End Destination for Services”, but will an ageing society rooted in Europe’s cultural heritage be innovative enough to meet this challenge? - Any region which can take up a position as a centre for developing renewable energy sources and propulsion technologies, as a “Région Créateur d’Alternatives” (“Area which creates alternatives”), in Europe’s centre of sustainability is guaranteed to be a winner. But will the area’s spirit and genius be sufficient to benefit from permanently high fuel prices? Those who choose to engage with this book and with contemplating the next 20 years will be rewarded not only with some answers, but hopefully also with the right questions.